The Wells County Chamber of Commerce staff, Ambassadors and Bluffton NOW! 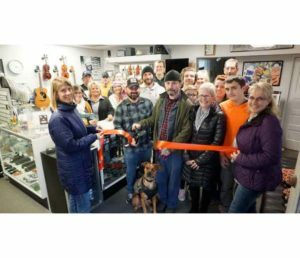 welcomed Brent Garrett, owner, with Old 303 Music store located at 303 Market St in Bluffton with a Ribbon Cutting on November 9, 2018. Olde 303 Music opened their doors this past August. Olde 303 Music will carry the basics of what musicians need such as strings and supplies. Garrett explained that another unique service they offer is the hand-crafted custom artwork that can be created on guitars, amplifiers, and drum heads. “People can see some of our works of art on our website at olde303music.com,” Garrett said.